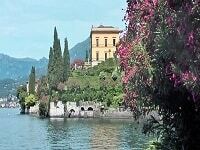 Explore the wonders of Italy on this 11-day tour of Italy. 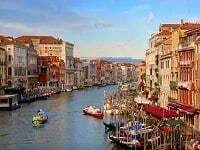 This tour package includes 2 nights in Rome, four nights in Tuscany with 2 in Lucca and 2 in Florence, two nights in Venice and 1 night in Assisi. 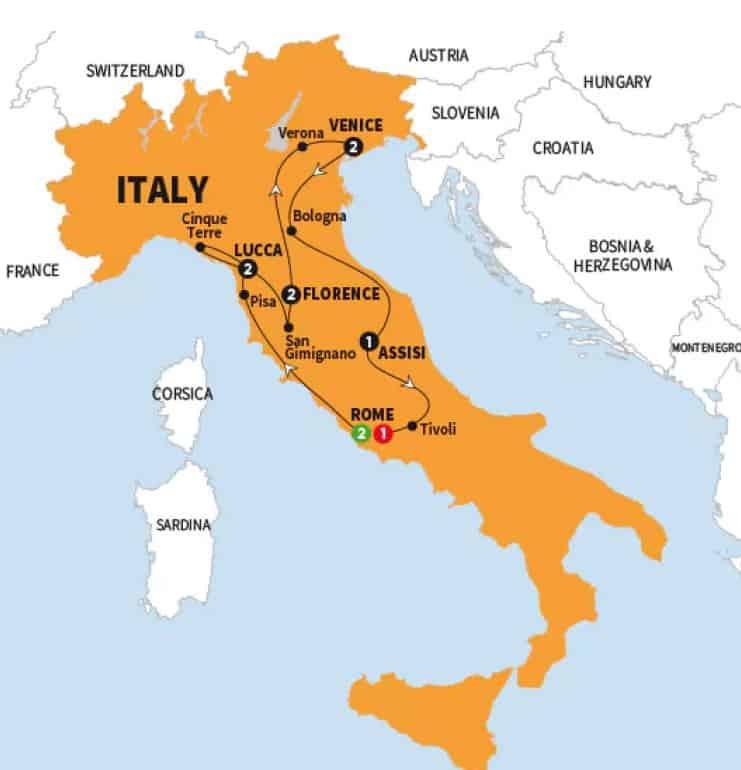 The itinerary includes excursions to Cinque Terre on the Ligurian Coast, Tuscany’s famous hill town San Gimignano, Northern Italy’s romantic town Verona, Italy’s culinary capital Bologna, and the peaceful Umbrian town of Assisi. For a daily itinerary click here. For informational about additional optional tours scheduled during what is otherwise free time click here. To book the 12-Day Rome, Tuscany, Venice, Assisi Tour and for the price with airfare from your preferred departure city submit the form or call ItalianTourism.us 800.227.1577. Rome Sightseeing with a Local Specialist includes a visit to St. Peter’s Basilica in the Vatican, The Vatican Museum and Sistine Chapel, and Ancient Rome and the Colosseum. Venice Cruise by private boat to St. Marks Square. 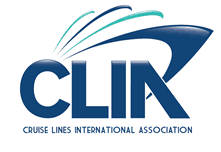 Travel between cities by luxury motorcoach with wifi. For a day by day itinerary click here. A scenic drive into the Chianti hills, past vineyards, brings us to a delightful hamlet overlooked by an imposing castle. Our destination is the ancient stone house of Machiavelli, where the great political theorist wrote his immortal work, ‘The Prince’. After a welcome drink and visit of the villa and its wine cellars, we’ll enjoy the best of Tuscan cuisine accompanied by great music and drinks, including of course, Chianti from the Villa’s own vines. This is the essence of all great things Tuscan, past and present, condensed into one memorable evening! Accompanied by a Local Specialist, you’ll visit the magnificent Doge’s Palace and its elegant courtyards, which were home to the rulers of the Venetian republic. Afterwards, we’ve booked an entrance into the Byzantine Basilica of St. Mark the Evangelist, patron saint of Venice. Price published is for land only. Enter preferred departure airport above and submit form for air itinerary and price of Italy Tour with airfare from your preferred departure city. This morning you will arrive in Rome. One of the most beautiful cities in the world, known as the Eternal City, when you arrive you will know why! 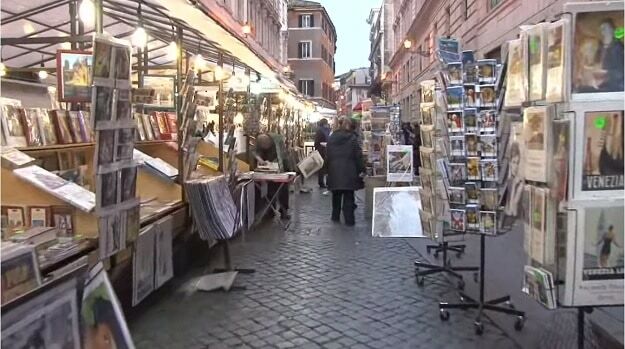 You’ll check into your hotel then to get your legs back take a stroll around Rome’s ancient cobblestone streets. Head back to the hotel late this afternoon to relax and meet your tour director. This evening head back out to enjoy Rome. This morning your Rome sightseeing tour begins in Vatican City. There a local guide will take you through St Peter’s Basilica to see Michelangelo’s famous Pietà sculpture and Bernini, the architect of Rome, works. The day includes tour of the Vatican Museum with an expert Vatican tour guide who will explain the highlights putting the collection in its historical context. You’ll also visit the Sistine Chapel where you’ll have time to admire Michelangelo’s magnificent fresco ceiling. After the Vatican you’ll cross the Tiber River to visit the ancient Roman Forum and Colosseum. This afternoon you have time to stroll around and discover Rome’s ancient alleys, beautiful boutiques, and lovely piazzas on your own or join an optional tour. We leave Rome this morning and travel north to the city of Pisa, visiting its Square of Miracles to view the architectural feat of the Leaning Tower and picturesque UNESCO designated Piazza del Duomo with Italy’s largest Baptistery. After Pisa located along Tuscany’s cast we travel to another Tuscany town, Lucca. There we’ll pass the Renaissance walls to enter the historic center of Lucca. Upon arrival enjoy an orientation tour past the 14th century San Martino Cathedral, Piazza San Michele with Archangel Michael standing watch and the Piazza dell’teatro, built on the site of the Roman amphitheatre. Meander along the medieval streets to the dramatic aria sounds of Puccini, one of Lucca’s most famous sons, or ascent one of the city’s ancient towers for panoramic views. 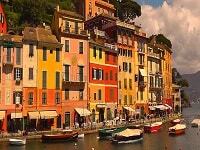 A sea of pastel pinks, yellows and blues cling dramatically to the Ligurian cliffs in the charming Cinque Terre (Five Lands) UNESCO World Heritage Site which we will have an opportunity to explore today on our included excursion. Join a Local Specialist and travel by boat and train to experience unforgettable old-world charm in two of the five picturesque fishing villages that have enchanted visitors who have made the winding journey to these hidden treasures over centuries. This magnificent coastline can now only be reached by boat or train from La Spezia. The gentle Tuscan landscape gives way to the hilltop town of San Gimignano, famed for its stunning medieval architecture and 72 historic towers which stand today as a testament to the wealth and power of aristocratic families that lived here centuries ago. We enjoy a Be My Guest lunch with wine in a beautiful family owned vineyard overlooking the rolling Chianti Hills, before arriving in Florence, our home for the next two nights. Discover Renaissance treasures, extraordinary art and exquisite architecture in one of the cultural capitals of the world. We join a Local Specialist who will bring the legacy of the influential Medici family to life. Walk along the cobblestone lanes into expansive piazza, viewing the magnificent marble Duomo and the replica of the David statue in Piazza della Signoria. View the 400-year-old Ponte Vecchio and admire spectacular panoramic views from Piazzale Michelangelo. The rest of the day is yours to explore the Cradle of the Renaissance on your terms. You may want to use your time to visit the masterpieces of Michelangelo, Botticelli and Da Vinci at Uffizi Gallery, wander through the architectural wonder of Palazzo Pitti or shop for high quality leather and gold. Shakespeare’s star-crossed lovers are remembered today during our jaunt to the romantic city of Verona where we will view Juliet’s Balcony and the 1st century Roman Arena, still used today to host spectacular operatic performances. We venture to Venice next, our home for the next two nights, spending the rest of the afternoon at leisure to meander through the city’s labyrinthine in search of hidden treasures. Wander along the Grand Canal, watch the sun set over St. Mark’s Square or take an Optional Experience to discover la serrisma. Breath in the salty smell of the Adriatic and cruise by private launch to visit the city’s most spectacular attractions. We cruise by private launch to the island of Giudecca to enjoy a unique Cultural Insight into the centuries-old tradition of Venetian glassblowing before seeing St. Mark’s Basilica, the ornate Doge’s Palace and the Bridge of Sighs, so named for the sound that prisoners being led to their fate would make upon seeing beautiful Venice for the very last time. This afternoon, sit back and relax at a cozy bacaro sipping the spicy citrus flavors of Spriz Veneziano or perhaps take a cruise across the lagoon to the colorful fishing island of Burano for delicious meal. Travel through scenic countryside to the mystical town of Assisi, stopping en route in the city of Bologna to view its Kissing Towers that lean towards each other, seemingly poised to embrace. We continue to our hotel in Assisi where we will dine this evening. Discover the legacy of St. Francis of Assisi in his home town on the slopes of Mount Subasio. Ambling Assisi’s charming streets, we join a Local Specialist who will take us on a fascinating walking tour to visit the Basilica of St. Francis, renowned for its beautiful frescoes depicting the life of this much-loved saint. We continue to Tivoli for a guided visit with a Local Specialist of the UNESCO World Heritage terraced hillside Renaissance gardens of Villa d’Este. Wander past bubbling fountains, manicured hedges and ornate statues as you soak up the tranquil atmosphere against the panoramic views of this historic hill town. This evening we enjoy an early special Farewell Dinner with our fellow travelers and Travel Director before returning to Rome.